PCRM has been working for years to convince the Department of Defense to do the right thing: transition to superior nonanimal training methods for military medics. Now, we're in the homestretch! That's why we've launched our Forced to Serve: Stop the Animal Draft campaign, which I hope you'll support. I would like to share with you information about our urgent campaign to spare thousands of animals—like the pig pictured here—from suffering and dying at the hands of the U.S. military. After reading more about our plans, I hope you will make your donation of $25 to help us raise the $100,000 needed to fund this—and all our urgent and lifesaving campaigns—immediately. 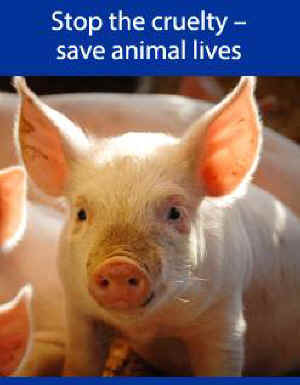 If we don't win this campaign, thousands more innocent animals will suffer from birth until death. First, they'll be caged and confined, waiting to be shipped off to a training site. When they arrive, the cruelty will get worse. Goats and pigs may have their legs chopped off, throats cut open, or may even be stabbed, shot, and burned to mimic battlefield wounds. Then they'll all be killed. We can't sit idly by while our own government is abusing these poor animals! We must do everything possible to prevent such horrible suffering in the future. So please do your part by supporting this campaign today. Your support will enable PCRM to demonstrate the widespread support for ending the needless killing of animals in military combat trauma training courses. It will also help us enlist veterans to speak on behalf of nonanimal training methods, file federal complaints, conduct a federal awareness campaign, and get more than 50,000 petitions to the Department of Defense. We've made such progress over the years—this is our moment. Let's work together to secure the victory we've all been working for!